Whether on site or when booking, we are listening to your expectations and requirements and can advise you in your selection. Do not hesitate to contact us for further information. This zone is located in close proximity to the river. These sites are mostly shaded and cool; to better enjoy the beautiful setting. Located directly by the river’s edge these rectangular camping pitches are the delight of large families. The majority of these pitches are separated by plants, limiting them from being overlooked upon and giving you privacy.. The Cherry Tree Zone is located away from other areas. It is the small campsite within the campsite, a small peaceful corner in the back, next to the river, only accessible to tents and small caravans. 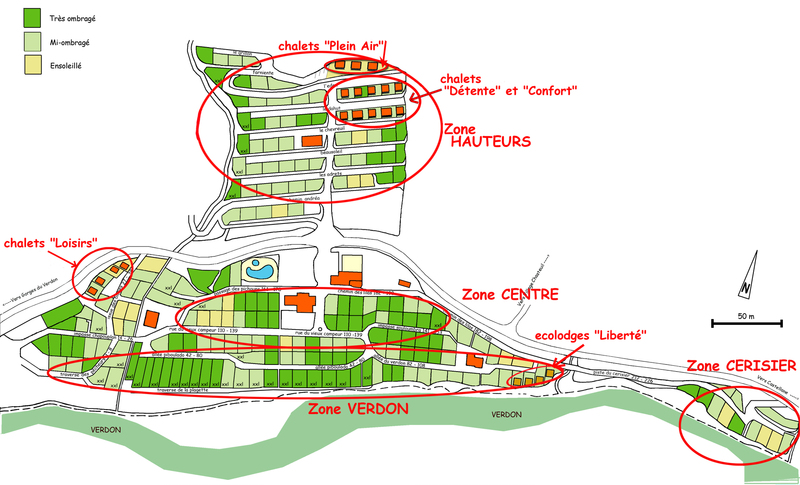 The Centre zone is at the living heart of the camping. The majority of the pitches here have shadow and are located close to all services and amenities of the campsite. Ideal for large families, these extra larges pitches of 140m² pitches also benefit from the central location of the zone Center, near all amenities. The zone Hauteurs lies on the other side of the main road. Laid out in a terrace arrangement higher above the rest of the camping, you are not overlooked upon and can enjoy the peace and tranquillity. MARTIAL’S TIP: Our pitches can be connected to electricity in 10 amps (2000 watts). Make sure you bring your electrical adapters and extension cords (minimum 20 meters). If needed you can also get them from the little shop on site.